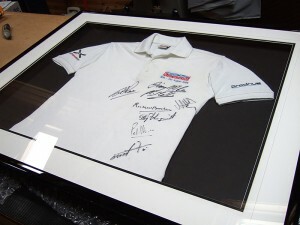 An autographed sports shirt requires to be mounted and framed in a narrow black shallow rebate moulding. (Many frames for sports shirts are constructed with deep rebate mouldings, limiting choice). Prepare the shirt, iron it and then make it rigid for mounting. Cut a mount to surround the shirt and space it from the backing board with pieces of black core foam board. Attach a backing board to the wooden box walls. 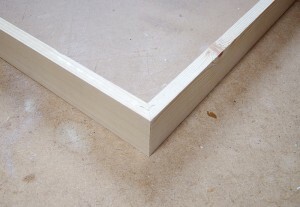 Create a frame from moulding. 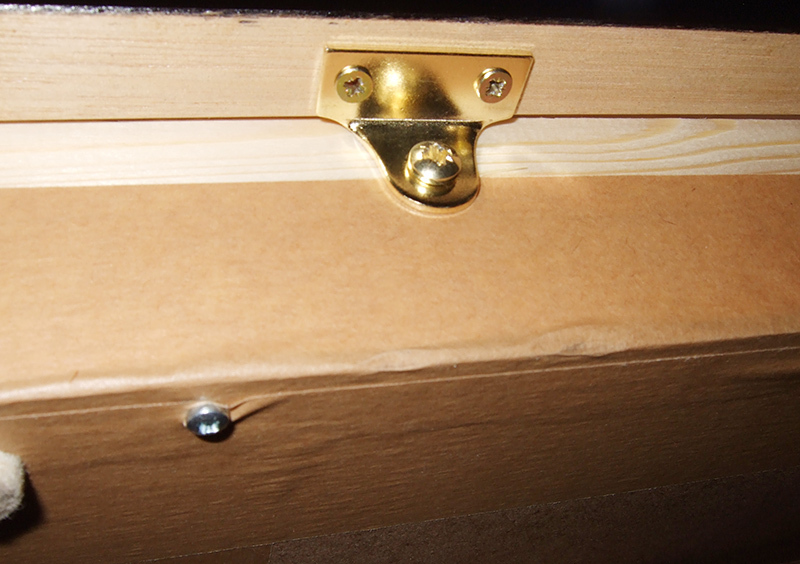 Fit mount to wooden box. This process sounds straightforward, but the first 2 steps can take over 2 hours to do. Stretching and stitching the shirt to the backing foam board is a slow and manually intensive task. I started off by ironing the shirt, as it would otherwise just be crumpled and creased. 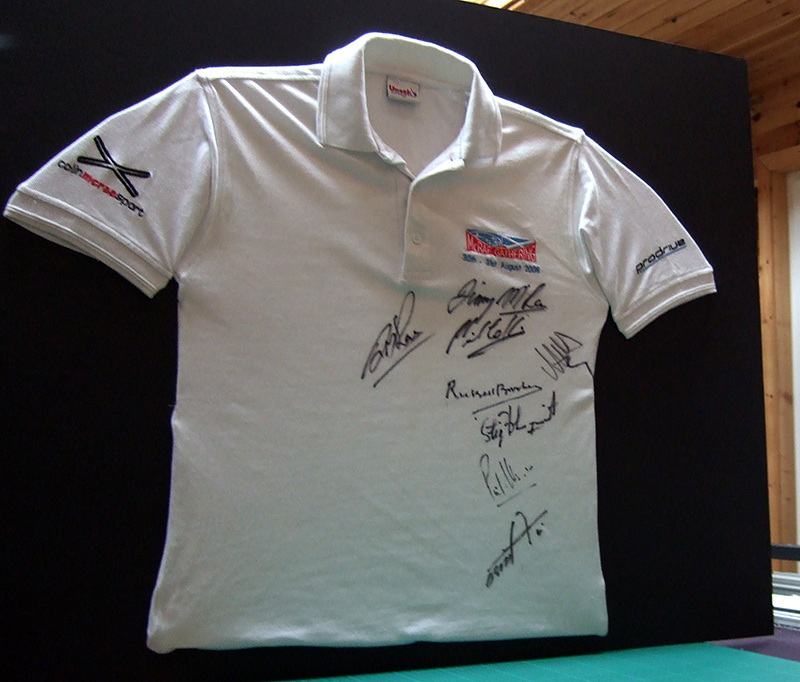 I do this by putting a tea towel between the shirt and the iron so that I don’t damage the shirt or signatures in any way. In this example it is a cotton shirt and I do want to get the creases out, so I used the iron on a steam setting. Note: this may not be the best setting for other shirt materials (please consult the garment labels before ironing!). Remember to iron the sleeves and collar to be as close to the way you want them to appear when framed. To make the shirt rigid, I cut out a piece of mount board in roughly the shape of the shirt but wider, so that the shirt will stretch out and look unwrinkled. The mount board is used white side forward so as not to let a colour show through, making the shirt appear less than white! I made a rounded cut-out at the collar location so that the mount board would not be visible. You can see the mount board in the image shown as I have the collar undone to allow access for stitching. In this project I also made small mount board cut-outs to stretch the sleeves as they had to display the logos on the sides of them correctly. All mount board cut-outs are carefully positioned inside the shirt to give it a flat, stretched out look. 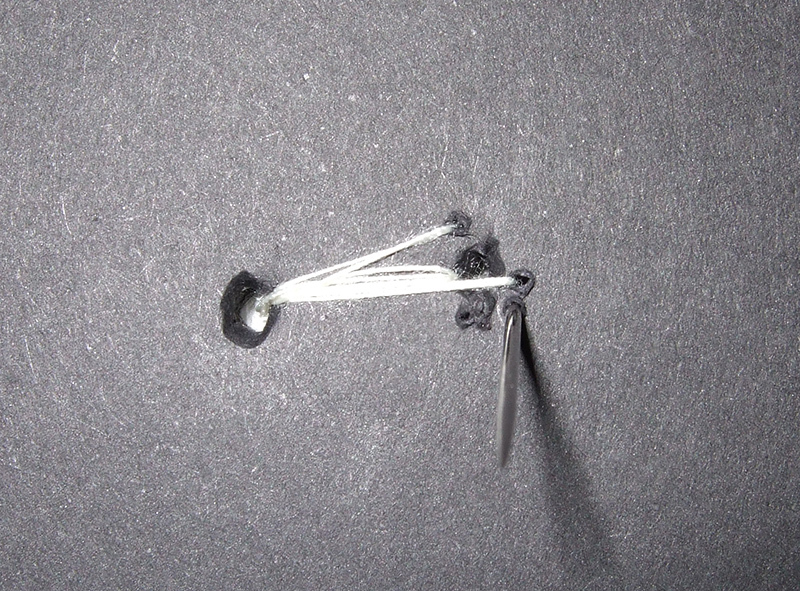 The sewing is done at various points around all the edges of the stretched shirt and sleeves to hold it firmly in place on the backing foam board. I tend to use a standard cotton thread that is as close to the colour of the shirt as possible with a medium sized standard sewing needle. 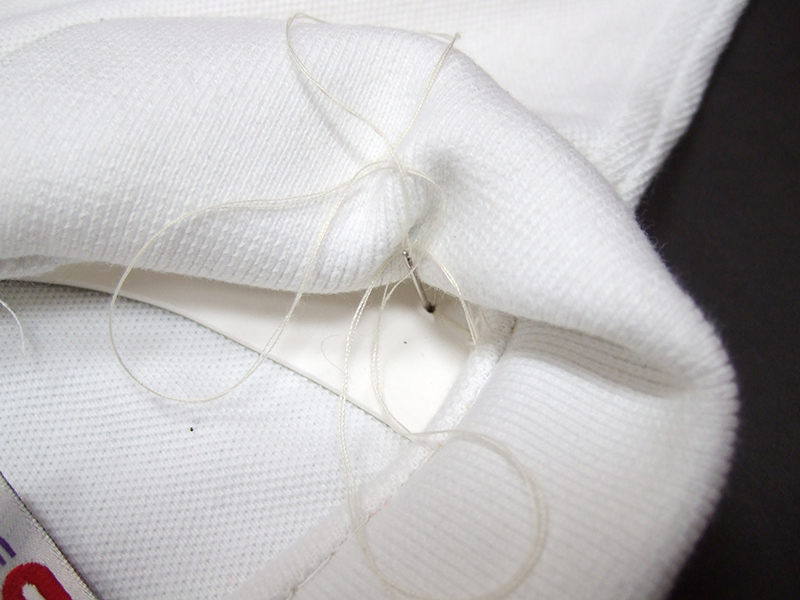 You can sometimes sew directly from the visible side of the shirt to the foam board at the back if the thread is very close in colour and you make stitches at the location of existing shirt seams where they will not be as noticeable. Where possible, just hide the stitches – eg behind the collar is a great place. The shirt will need to be stitched several times and in different places along the neck and shoulders as this will be the best anchor point for ‘hanging’. 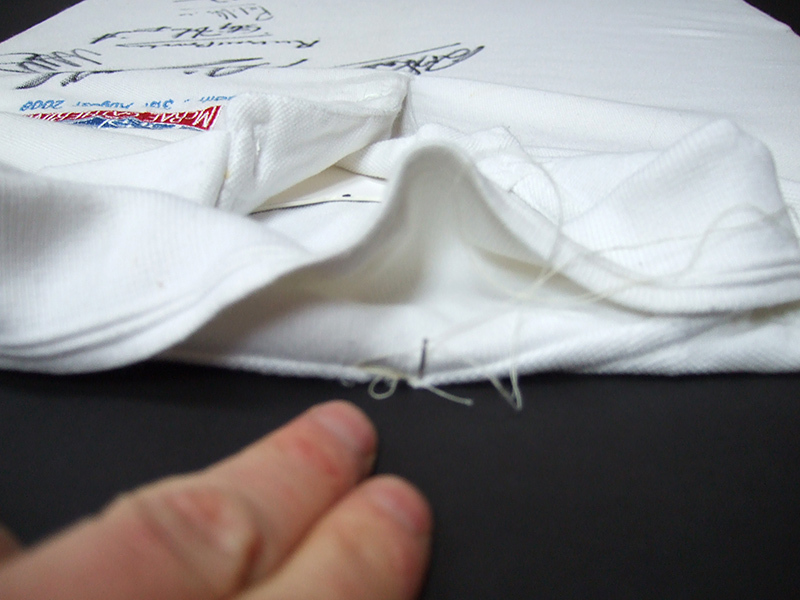 I usually do about 20-30 separate stitching points in total to secure the shirt to the backing board. After I finish each stitch I cut the thread, then tape down the loose ends of the thread to the back of the foam board with ph7-70 self adhesive conservation tape. After the shirt has been stitched to the backing foam board, you should be able to stand it upright and see how it looks when it is vertical. If you see any loose or crumpled areas or some other gravity effect you don’t like the look of, then you will need to add in another stitch or two to make it look better. It should be noted that this is how the shirt will look in the frame while hanging on a wall. Cutting a mount for a shirt is no different from cutting a mount for a picture, except that shirts are large and hence the surrounding mount will be large too! 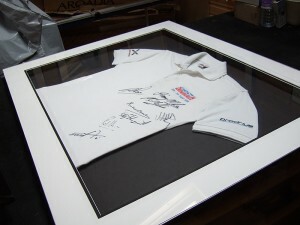 You also have to be able to keep the glass away from the shirt and hence need the box frame to do this. The mount itself should be wide enough to hide the internal sides of the box. After I cut the mount, I use strips of black core foam board (so it’s dark and invisible should anyone peek in behind the mount) to space the mount from the backing foam board. The foam board strips are held in place by ph7-70 ATG double sided tape. 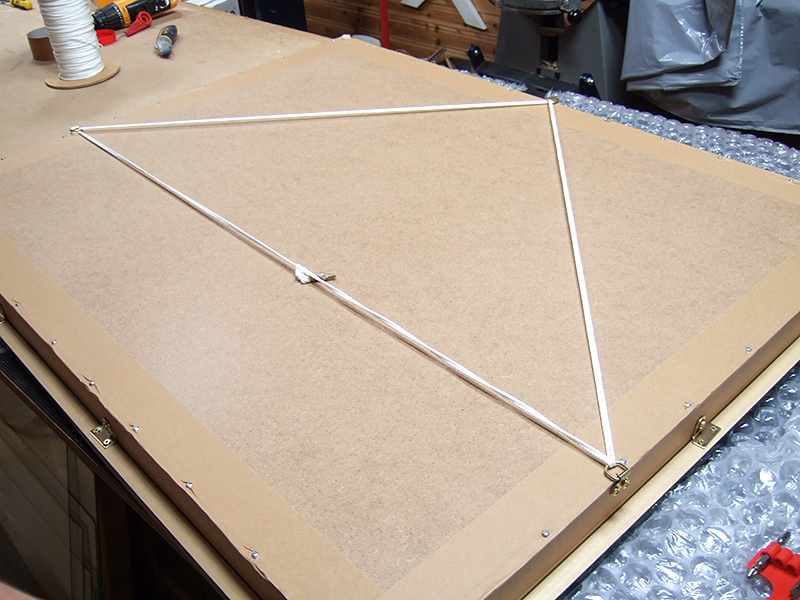 Once finished, the mount and foam board strips and foam backing board should look something like this. It is starting to look like the finished item. For the walls of the ‘box’ I just use thin strips of inexpensive 44 x 12mm (1 3/4″ x 1/4″) pine wood bought from a local timber store. I use the mitre guillotine to mitre them and join them with v-nails as I would for a standard frame. 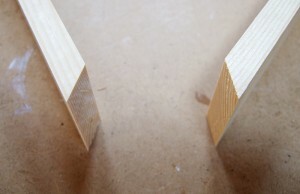 The v-nails are put into both the top and bottom edges of the box corners, as well as wood gluing them together. The size of wood you use here will determine the depth of the box, so if you want a deeper box then go for >44mm if you want less depth go for <44mm. The whole point of the box is for it to be deep enough to keep the shirt (or another 3D object) from contacting the glass. Just measure your object’s deepest dimension to come up with an acceptable depth. I then cut out a piece of 2mm MDF to the exact outside edge size of the wooden box walls. 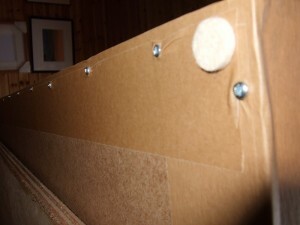 This backing MDF can be screwed or nailed down to the box walls. The end result will be an open sided box, almost like a crate with a front missing. I finish the long edges off by taping them together with ECO25 frame backing tape before securing the MDF backing with pan headed wood screws. 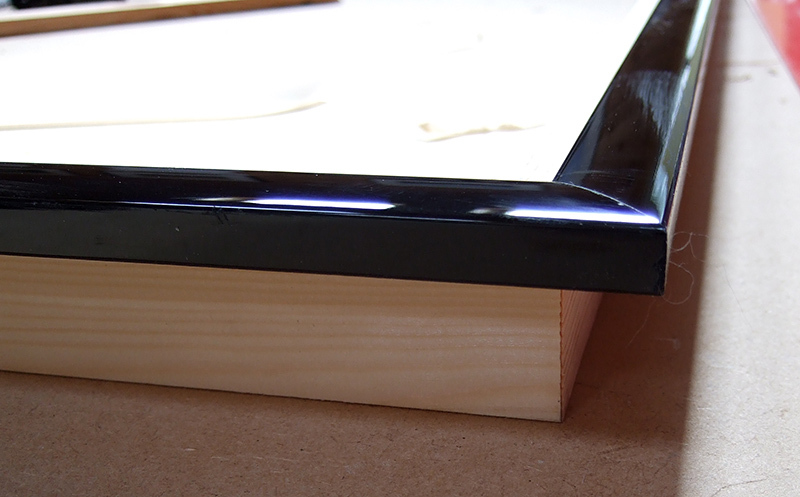 The next step is to cut the actual frame moulding. Because we have created a box (in effect a deep rebate), we can use any shallow rebate moulding to surround this box. This gives us a lot of flexibility when it comes to moulding choice – we can use any moulding, as opposed to just using the one or two deep rebate mouldings that we may happen to have in stock. We cut the front frame to fit the box outside edges. Once finished, it should sit perfectly on the wooden box as shown. We can remove the frame for now and place it to one side. One point of note is that there will be no weight bearing done by the front frame as the cord and d-rings will be screwed into the box, so theoretically, you can use quite fine moulding here. I usually use a small vacuum cleaner to clear out any loose specks of dust, dirt and hairs or threads inside the foam or mount enclosure and the shirt surface before fitting the glazing. Remember that this is the last chance to spruce the shirt up before displaying it. We can now cut the glazing to fit exactly on top of the mount after cleaning both sides of the glass. This will keep all external dust, dirt etc out of the shirt and mount area. The mount with shirt and foam backing can then be fitted into the wooden box that we created earlier. 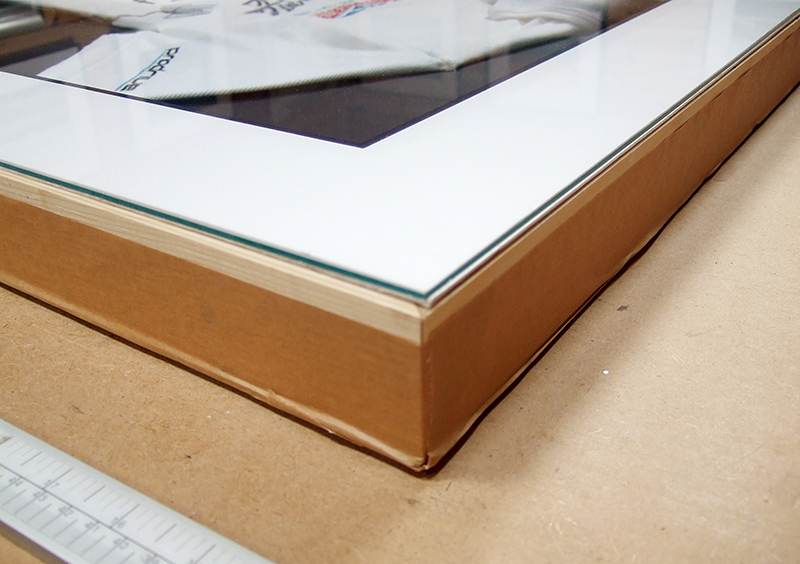 The mount edges (and glass edges) should completely cover the wooden box to its outside edges. If the depth of your mount is slightly smaller than the depth of the box, you can pad out the difference with foam board offcuts. The next step involves placing the constructed outer frame (moulding) over the glazed and boxed shirt. We then proceed to join the moulding to the wooden box. For this I am using brass plated right angled picture plates which are screwed into both the wooden box sides and the back of the moulding. To finish the frame I delicately flip it over, face down on bubble wrap to protect the moulding face from damage and place felt pads at each bottom corner (for wall protection) as well as brass plated two hole d-rings at the side and at the bottom of the box frame (not the front frame) to distribute load. I tie it up with #3 low stretch picture cord. The frame is now finished and looks just like the first image at the top of this article. 3D box frames can be accomplished more simply with a deep rebate moulding, quite often without a mount, but this generally limits the choice of mouldings that you can offer. It also limits the depth of the frame box to whatever the rebate depth is, which may be fine for some thinner 3D objects and collarless sports shirts. With the method described in this article, I can build deeper boxes if needed so that I can frame something with bigger depth dimensions without the need for specialised deep rebate mouldings. The only downside to 3D frames is the time it takes to make them, which can take anywhere from upwards of 5 hours. 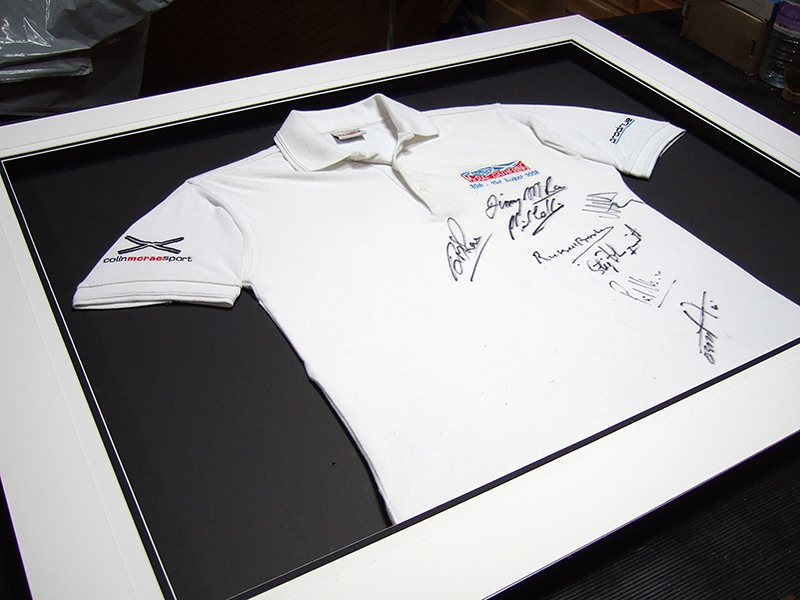 This entry was posted in 3d box frame, picture framing information and tagged 3d box frame, box frame, framing memorabilia, framing shirt, framing sports top. Bookmark the permalink.